Transport systems are facing an impossible dilemma: satisfy an increasing demand for mobility of people and goods, while decreasing their fossil-energy requirements and preserving the environment. Additionally, transport has an opportunity to evolve in a changing world, with new services, technologies but also new requirements (fast delivery, reliability, improved accessibility). 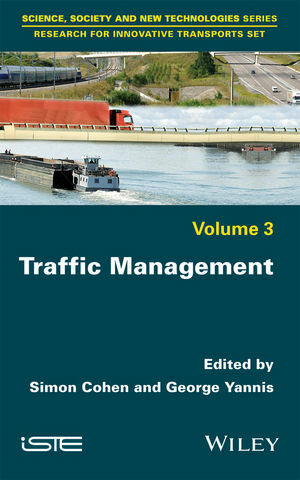 The subject of traffic is organized into two separate but complementary volumes: Volume 3 on Traffic Management and Volume 4 on Traffic Safety. Traffic Management, Volume 3 of the ‘Research for Innovative Transports’ Set, presents a collection of updated papers from the TRA 2014 Conference, highlighting the diversity of research in this field. Theoretical chapters and practical case studies address topics such as cooperative systems, the global approach in modeling, road and railway traffic management, information systems and impact assessment. Simon Cohen is senior researcher at IFSTTAR and Professor at Ecole des Ponts ParisTech in France. He is director of the French Abertis chair in transport infrastructure management. Much of his career has been in the field of transportation research. His work focuses mainly on the area of advanced traffic management and intelligent transport systems (ITS) for road networks. George Yannis is Professor in traffic safety and management and head of the department of Transportation Planning and Engineering of the School of Civil Engineering at National Technical University of Athens (NTUA) in Greece.? He has contributed extensively in several research projects and scientific committees of the European Commission and other international organizations (UN/ECE, OECD, WHO, CEDR, ERF, ETSC), having published more than 350 scientific papers (110 in scientific journals) widely cited worldwide. Bernard Jacob (Set Co-ordinator): Chair of the Programme Committee of TRA2014, is deputy scientific director for transport, infrastructures and safety with IFSTTAR. His research works are in bridge and road safety, traffic loads on bridges, heavy vehicles and weigh-in-motion. He is Professor at Ecole Nationale des Travaux Publics de l'Etat in France, and the President of the International Society for WIM (ISWIM).